Arizona’s prolonged vote count has borne a batch of proposed law changes designed to speed up the process and instill more confidence in the system. It took a week in Arizona for a victor to be declared in the U.S. Senate race, which garnered national attention both for its competitiveness and the ensuing frustration of being unable to determine a winner for nearly seven days. And Arizona’s final legislative race wasn’t declared for a full 13 days after the election. That slow count is at the core of voters’ frustration with Arizona elections, since the lengthy process naturally invites skepticism about results, Republican lawmakers say. But GOP concerns extend to questions about the use of emergency voting centers and ballot curing, a process by which voters can assure their mail-in ballots count toward the final tally. Democrats have accused their colleagues across the aisle of playing a key role in fanning suspicion in the election process – chiefly by accusing Democrats of “stealing the election,” in the words of top officials with the state Republican Party. Where there is common ground to be found, it’s at an understanding that election results should be ready sooner than later. In Arizona, later is a period of time that grows longer by the election cycle. 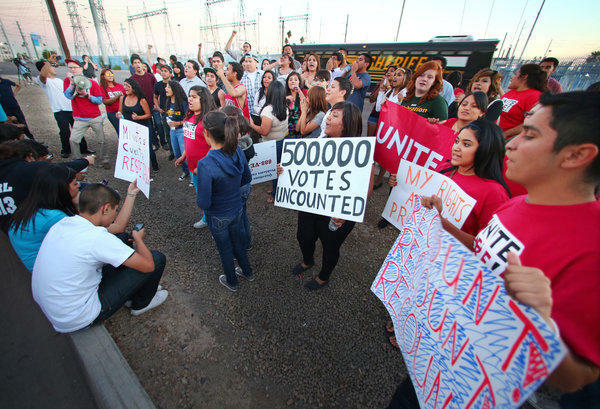 Election officials attribute that in part to historic turnout, but also to the system itself. Arizona essentially operates two elections in one, according to Eric Spencer, state elections director. There’s a mail-in voting system that more than 70 percent of Arizona voters utilize, but there’s also a robust day-of voting system that’s launched on Election Day. And given that Maricopa County is the fourth most populous county in the country, that is an incredible logistical challenge to pull off successfully, Spencer said. Blaming resources isn’t good enough for GOP Rep. Michelle Ugenti-Rita and House Speaker J.D. Mesnard, who are both considering bills they say could provide some incentive for voters who choose to vote by mail to actually do so. Both will be in the Senate next year. So-called “late-earlies,” ballots mailed to voters that don’t get turned in until Election Day, are the primary cause of the nearly-two week vote counting operation in Maricopa County. Signatures on the sealed, prepaid envelopes voters use to turn in those ballots must be verified. Ugenti-Rita, R-Scottsdale, and Mesnard, R-Chandler, propose to deal with “procrastinators” by requiring those voters to provide ID to poll workers when dropping off late-early ballots and feeding those ballots into voting machines on site.